Two seasons ago, Houston Texans wide receiver Will Fuller did something that only one other player -- DeSean Jackson -- had done as he began his NFL career with back-to-back 100-yard receiving games. As fast as he started 2016, things mostly went downhill after that hot start. (Of course, no player is going to have 100 yards in every game.) Fuller averaged 35.33 yards per game for the remainder of his rookie season. In year two, Fuller missed six games. Meanwhile, quarterback Deshaun Watson missed eight games. But when both were on the field (four games), Fuller went on a scoring spree. Granted, it's a small sample size, but Fuller scored seven times in those four games. All seven of his touchdowns last season were thrown by Watson (over that four-game span). During that stretch, Fuller finished as the weekly WR5, WR4, WR9 and WR3, respectively with a minimum of 12.2 (standard) fantasy points each game and an average of 17.7 PPG. In the six games he played without the dynamic signal-caller, he totaled just 15 catches for 144 yards and no touchdowns. That's an average of 2.4 standard fantasy points per game and, on average, he finished as the weekly WR71. His best performance over that stretch was five catches for 44 yards (4.4 fantasy points, WR47) in Week 15. With DeAndre Hopkins drawing most of the defensive attention, Fuller will have an opportunity for big plays (and touchdowns) to lead to big games. As a relatively low-volume WR2 though, there could be some boom-or-bust to his fantasy outlook. Durability could also be an issue as the 185-pound Fuller has missed multiple games in both of his seasons due to an assortment of injuries. But those durability concerns are indirectly magnified by the potential injury to Watson, given how often he'll run, last year's ACL injury and the team's porous offensive line. In the seven games Watson played, which includes a scoreless first half of Week 1 with Watson on the bench, the Texans averaged 30.71 (real) points per game. Without him, they averaged only 13.67 per game over their final nine. Meanwhile, Fuller averaged 21.46 yards per reception in the games Watson played. With Tom Savage or T.J. Yates under center, that dropped to 9.6 Y/A. And as noted earlier, Fuller finished as fantasy's weekly WR9 (or better) with Watson; the WR47 (or worse) without him. Even though Fuller and the Texans have to face the Jaguars twice this year (and every year), they face the league's stingiest fantasy defense in Week 17. Since most leagues conclude their playoffs in Week 16, that second matchup against Jalen Ramsey, A.J. Bouye & Co. is excluded from our fantasy strength of schedule calculations. Based on the fantasy points allowed in 2017 of Houston's 2018 opponents, Fuller has a bottom-half (20th-best) fantasy strength of schedule (Week 1 to 16 opponents), but a more favorable (7th-best) fantasy SOS in the playoffs (Weeks 14 to 16). 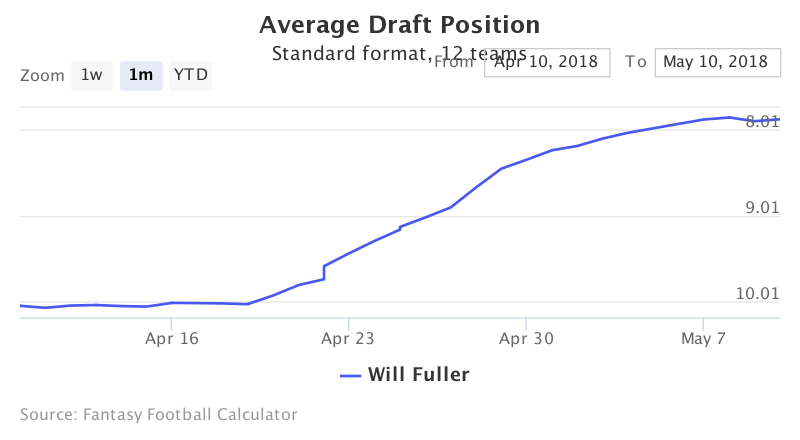 Fuller is currently the 35th receiver off the board at the end of Round 7 in FFC drafts. Receivers going off the board before him include Robert Woods (7.09) and Devin Funchess (7.10). Those going right after him include Julian Edelman (8.01), Cooper Kupp (8.05), Marquise Goodwin (8.07) and Kelvin Benjamin (8.08). Four games and four top-10 performances with Watson. Both need to stay healthy and Fuller won't be a top-10 performer every week, but there's a viable chance that Fuller finishes as a top-24 wide receiver (or better) on the year. Based on his current ADP (WR35), there is a strong chance that Fuller returns a profit for fantasy owners in 2018.